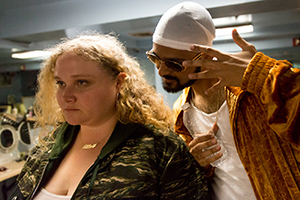 Patti Cake$ is a scrappy, gritty — and funny — tale of perseverance featuring a lot of promising young talent. It’s a tale as old as time. No, this isn’t Beauty and the Beast, but Patti Cake$ mines themes that have inspired storytellers and audiences through the ages. Dream. Out loud. In high volume. And never let The Man bring you down. In this case, the downtrodden is Patti Dombrowski (Danielle Macdonald, The East), an overweight 23-year-old girl desperate to get out of New Jersey, or, as it’s affectionately referred to, Dirty Jersey. Her mom, Barb (Bridget Everett, Trainwreck), is a drunk with some slutty tendencies who splits her time between barfly and bar songstress. Back in the ’80s, Mom made a run for rock ‘n’ roll fortune and glory. As big-haired Barb Wire, she rose to a certain level of success — her power ballad, Tuff Love, made it to vinyl. The musical gene courses through Patti. But her taste is more contemporary. It’s rap. And she knows how to spit. Call her Killa P (she murders the beat). Call her Patti Cake$ (her license plates read “PATTIWGN”). Of course, the odds are against Patti making it out of her dumpy digs, but she finds hope in an unlikely musical collective formed by her best friend, Jeri (a remarkable debut by Siddharth Dhananjay), who works by day as a pharmacist; a strange kid named Basterd (Mamoudou Athie, The Circle), who lives in a shack by the tracks, beyond a pedestrian underpass dubbed the Gates of Hell; and her gravelly-voiced, wheelchair-bound grandmother, Nana (Cathy Moriarty, Raging Bull), who keeps knock-knock-knocking on Heaven’s door. There’s nothing particularly new or innovative in terms of the story or how it’s told. Back in 2002, 8 Mile (starring Eminem), plundered similar terrain, as did The Commitments back in 1991. It’s a timeless story that’s easy to adapt for modern times and various art forms. What stands out here is the excitement generated by the fresh energy of the people telling the story. Writer/director Geremy Jasper cut his teeth on music videos for Selena Gomez and Florence + the Machine. Here, he’s making his feature film debut and it makes quite an impression. A New Jersey native, this is a personal story for Jasper. He knows how to play the visual cues; Patti’s musical fantasies bathe her in green light as she’s whisked away from the hum-drum Jersey life to the posh life of stardom — a life which allows her to walk on air as she tunes out the world by way of noise-cancelling headphones. On the other hand, reality is lit in a much less glamorous fashion. It’s interesting to see Chris Columbus among the slew of producers and Quentin Tarantino amongst those thanked in the end credits. Perhaps Columbus, the wunderkind writer behind Gremlins and The Goonies back in the ’80s, and Tarantino, the mastermind behind Pulp Fiction, are paying it forward. As for Patti herself, she’s played by an Australian native who speaks fluent Jersey girl. Danielle Macdonald’s an impressive on-screen force and she plays a sympathetic character stuck in a tight spot. She endures body shaming and name calling regularly, even from fellow rappers. “Dumbo” is a nickname she’s suffered with for years. She’s called fugly and advised to get a gym membership; she’s even referred to as Jabba the Hutt. At 23, she’s frustrated she hasn’t done anything with her life. Through it all, Macdonald makes sure Patti comes across as a human being, not a caricature. As with the previously mentioned 8 Mile and The Commitments, there’s some very real musical talent on display in Patti Cake$. That talent makes the characters come alive and makes their pursuit seem like it’s only a hot lick away from reality. Smartly, Jasper doesn’t focus strictly on rap. He acknowledges the old-school haters of rap, those who fail to see it as an art form and think rap has no redeeming value. At the same time, he embraces the overwrought emotions of ’80s power ballads and pays proper respects to the Jersey legend of all legends, The Boss, Bruce Springsteen. As Patti, Basterd, Nana and Jeri start to gel, they hit on a song and a name: PBNJ. It’s fun, it works. And all their effort culminates in a vicious, emotional performance during a rap battle of epic proportions. After the battle — and after tangential thoughts of the original Rocky flutter through the mind (with Nana taking on the Mick role) — a question lingers: What does Patti have to say? If she were to make it big, what would her songs be about? Does she have the drive to go beyond one hot song? What else is on that demo CD? Whatever the answers, Jeri’s guiding wisdom should help them prevail: No hate, no negativity — they’re toxic. They’ll need to raise their sights above the rabble if they want to raze their current Jersey-bound lives.